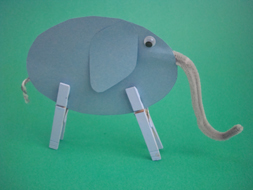 This Easy Elephant craft is a great idea for preschoolers and kindergartners, on up! It's easy to make with our printable templates, but still fun enough for older children to enjoy as well. 1. Prepare your supplies. You will need 2 ovals for the body and two ears. Trace the templates onto construction paper and cut out. Paint your clothespins to match the paper. 2. Fold a pipe cleaner in half and glue it to one end of the oval. Glue a small piece of yarn or string to the other end of the oval for the tail. 3. Glue the second oval over top to sandwich the pipe cleaner and yarn in between. 4. Glue on your ears and google eyes (or draw the eyes on) and secure your clothespin legs.